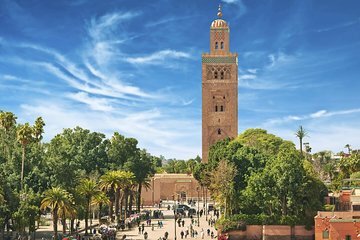 Immergiti nella città più intrigante del Marocco con un tour di un'intera giornata a Marrakech e scopri antiche tombe, un'imponente architettura e una vibrante cultura locale. Ammira il minareto svettante della moschea Koutoubia e le tombe saadite del XV secolo; passeggiare per le eleganti arcate e i lussureggianti giardini del Palazzo Bahia. Sperimenta il vibrante trambusto di Jemaa El Fna e affronta con incantatori di serpenti e ballerini, artigiani e acrobati in un'ampia piazza pubblica che è la fetta perfetta della vita dei Marrakechi. The afternoon was not needed. The Jardin Medera is not the typical use of the word garden, it was more of an olive grove. The guide was okay, he didn't make it very personal. The tour was overall ok but, I felt as though I was a bother to the tour guide. I was the only person on the tour. He took me to a carpet factory, 2 Argon oil places, and a woodworking place. I felt as though he was simply taking me around to his friends so that I could buy things. Since this was the last day of my travels, I had already bought everything that I was going to buy. After lunch, the tour manager commented, oh you don't like it here, you don't buy anything. I felt as though he could have talked more about Marrakech and Morocco in general, instead of trying to take me to his friends to buy things. The full day was not necessary to see Marrakech and I felt like he was taking me to these places to simply draw out time. Could have seen these things on my own probably.